This Sparks label may well be the label that ignited a big controversy, coming to a boil eight years later. As near as we can tell, it is the first or one of the very first label approvals showing the direct addition of caffeine. Since then, TTB has approved hundreds or thousands of labels with a similar caffeine-alcohol combination as per this list, as explained by TTB here. Beginning about two years ago, CSPI began vigorously challenging caffeine-alcohol combination, and then the states and the FTC jumped in. In November of 2009 FDA said the drinks probably should not be allowed. Caffeinated Sparks is gone, but the controversy burns on. Holty’s Cyclone is a much earlier approval, and contains at least two sources of caffeine — but it does not have the directly-added caffeine that makes the 2001 Sparks approval noteworthy. Holty’s is beer with added ginseng, guarana and kola nut. 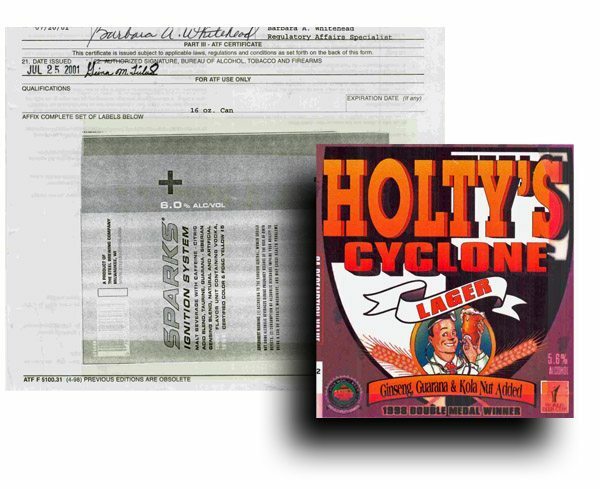 It is quite amazing that Holty’s has an image of a doctor examining the beer and seeming to approve, along with a reference to Dr. Holty. It is also surprising that the product lacks anything resembling a modern statement of composition. The terms are all over the place, from lager to herbs to the stimulants.